Visit Amaray Box Packaging on our Main Site! Build your package with DVDs in Amaray type Cases. If you have a multi-disc set, you can specify the disc types below and use double or triple disc cases. The cases comes with 4C full color offset printed inserts (offset printing always gives you the highest quality, just like the disc printing!). 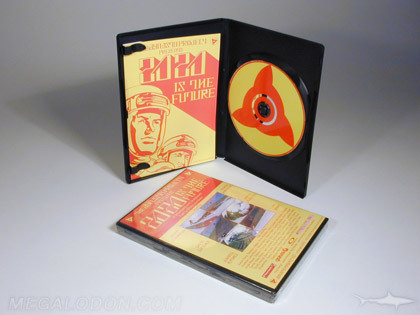 The DVD Wrap is placed under the clear plastic surrounding the case, and is visible from the outside of the package. When we use a Black (solid) case, the DVD Wrap is printed one side (4C/0C) only as the inside can't be seen. Transparent Cases (See Super Clear or Frosted page) are available at a very minor cost increase and allow the reverse of the DVD Wrap to be seen. With Clear Cases, the DVD Wrap is printed both sides. For a wilder effect, consider our XRAY Cases (see Xray Case page) - these use a clear case with Clear Printed Plastic Inserts in them. You can have all kinds of fun with this one. How about a clear sub disc in these....whoa. Inside Literature is also available. Inserts or Booklets are 4C offset, any size you need. To dress up your title, add a 4C Slipcase. Add on special features such die cut windows, embossing or hot foil stamping. Remember - packaging sells! And slipcases make the package more impressive, more substantial (i.e., worth more), more artistic, more visible, and gets more attention. What does this mean to you? Upgrade to clear box, "frosted" finish. Includes 2-sided wrap, 4C/4C. Upgrade to clear box, crystal clear finish. Includes 2-sided wrap, 4C/4C.